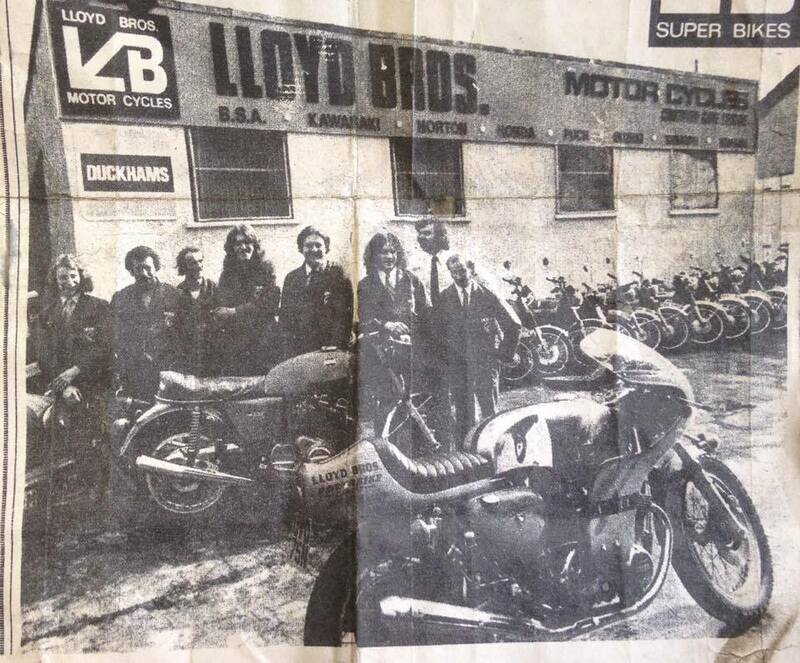 We were looking for a picture of the George Lloyd Motorcycle supermarket in Peacock Cross (Which is now a Carpet superstore) as i understood they were one of the largest motorbike suppliers in the UK. We couldn’t track a picture down, however we did manage to hear a little bit about the Bike superstore. 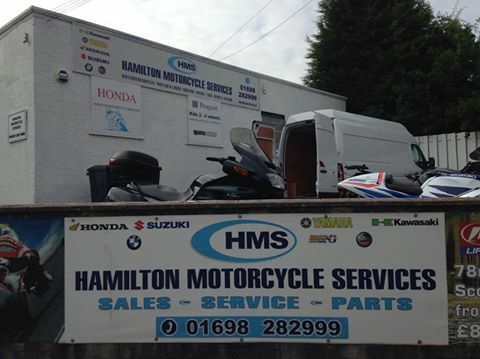 I spoke with Yvonne Hamill who works at the Hamilton Motorcycle services and she did manage to track down a picture, she told us. “In the picture is George Lloyd who is the one with the white shirt (far right) next to him on the left is Bert Sneddon then next is Hugh Adams only other one that I can recall is on far left who is Billy Strain. George Lloyd died in 2013 and is buried in the bent cemetery. His business lives on through his wife and kids. This is the works shop the show room was in Cadzow street which became the rococo night club. They then moved to their purpose build show room at peacock cross which is now a carpet shop. George Lloyd was the biggest motorcycle set up in Europe in the 1970s. The Garage as it is today. 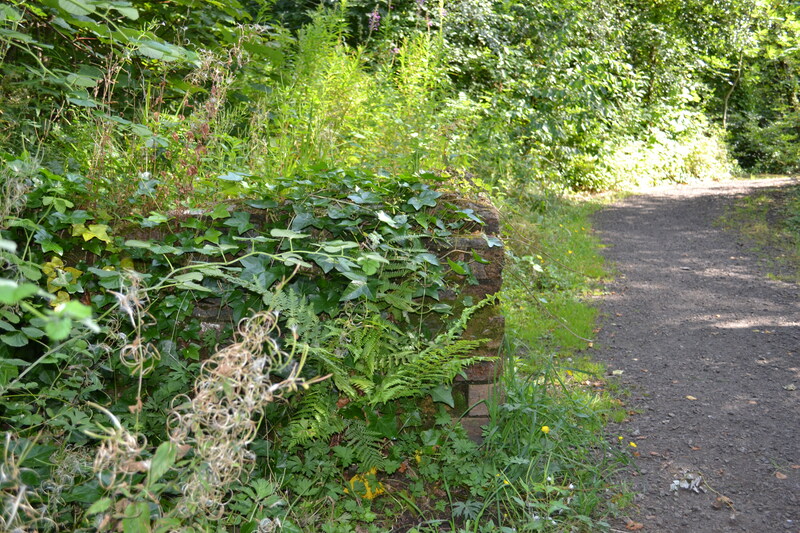 Much of the Silvertonhill estate was built by breaking through the boundary wall of the “High Parks”: the Duke of Hamilton’s hunting estate. The old Duke had wisely insisted that this original estate have a high ratio of green space to housing, resulting in the huge green park space between Chatelherault Crescent and Silvertonhill Avenue; a factor that contributes to the enduring appeal of the area. This green land notably contains some of the Old Oaks for which the High Parks are famous. The woodland of the High Parks to the east of the area is the Duke’s private land but is an extended playground for local children, along with the nearby banks and cliff faces of the Covan. When originally built the estate was also famous for having only three patterns of key amongst the hundreds of front doors. If locked out, one simply borrowed one’s neighbour’s key. There were no mortice locks fitted as standard and children returning home were able to put their arms through the side mounted letter boxes and release the latches. Originally, Bannatyne & Jackson’s rose nursery occupied a wide strip of land some five hundred metres long on the north side of the wall, outside the High Parks. This ran from Hutchison Street in the south almost to the Covan Burn in the north east and the land was sold off in three stages from 1962-1977. The newest housing in Silvertonhill dates from this last stage. 1895 Map of Silvertonhill with a Satellite overlay Showing a farm house at Larch Grove. 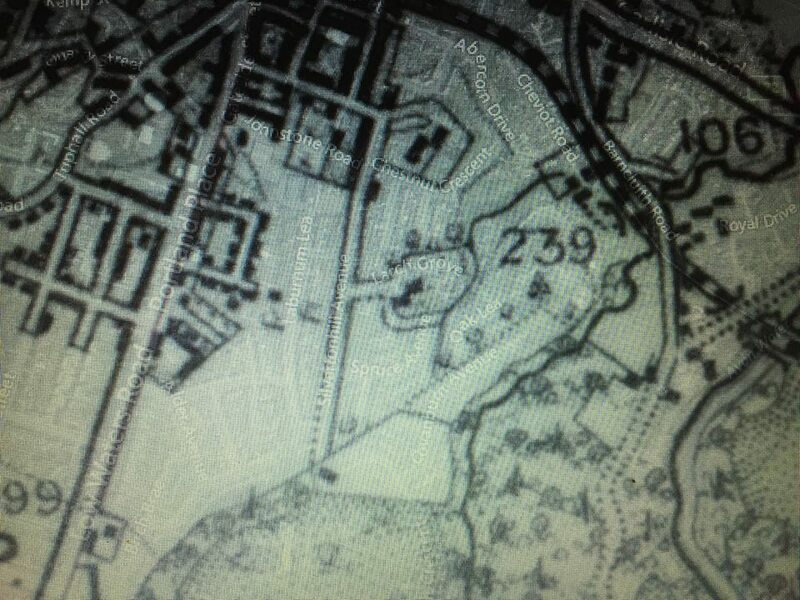 Old maps of the area show only one house on the old road. 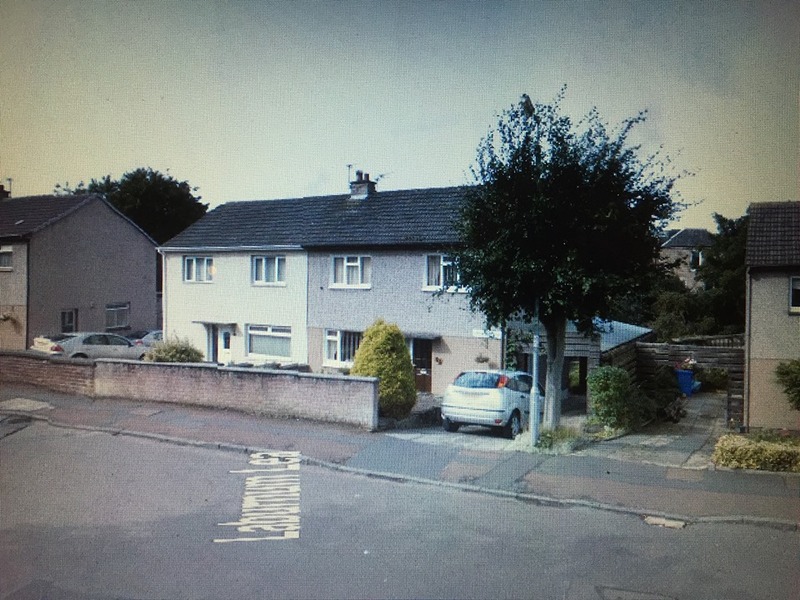 It is the detached house immediately to the south of Johnstone Road. There is also a farm house or Building situated where the now Larch Grove has been built. The local nickname for this area is “Spam Valley”, as a joke they say the people spend so much money on their houses that the only food they can afford to buy is Spam. One of the streets that was built is called Laburnum Lea! 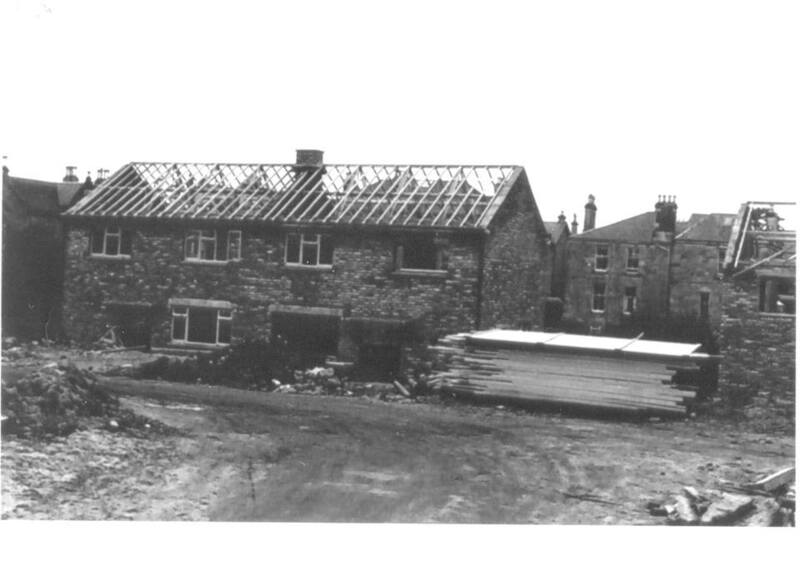 In the picture is Laburnum Lea under construction in 1963, at which time it was the only private estate in that area. 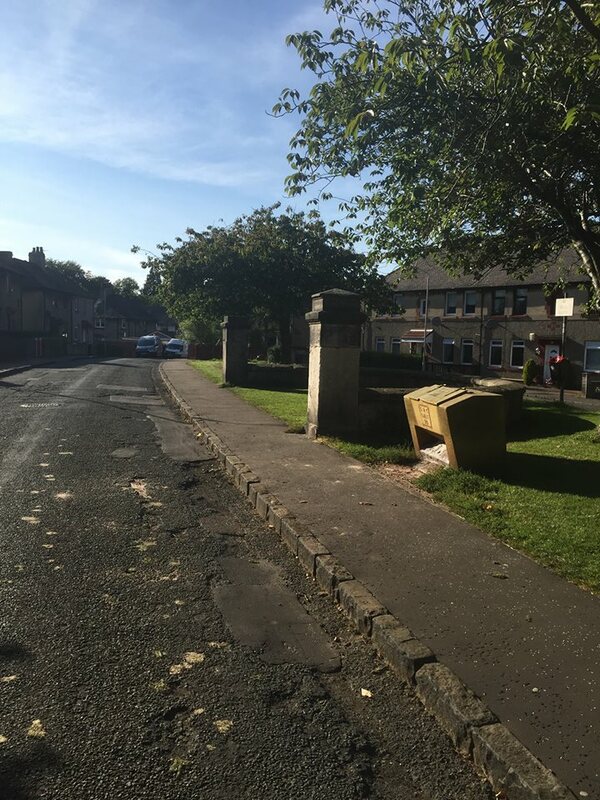 When this street was under construction there were a few houses at the bottom end of Silvertonhill Avenue but from the land which is now occupied by Chatelherault primary school were open fields which stretched all the way up to Strathaven Road and which were occupied by grazing cattle. Laburnum Lea as it is today. The Construction of 55 & 57 Laburnum Lea in 1963. 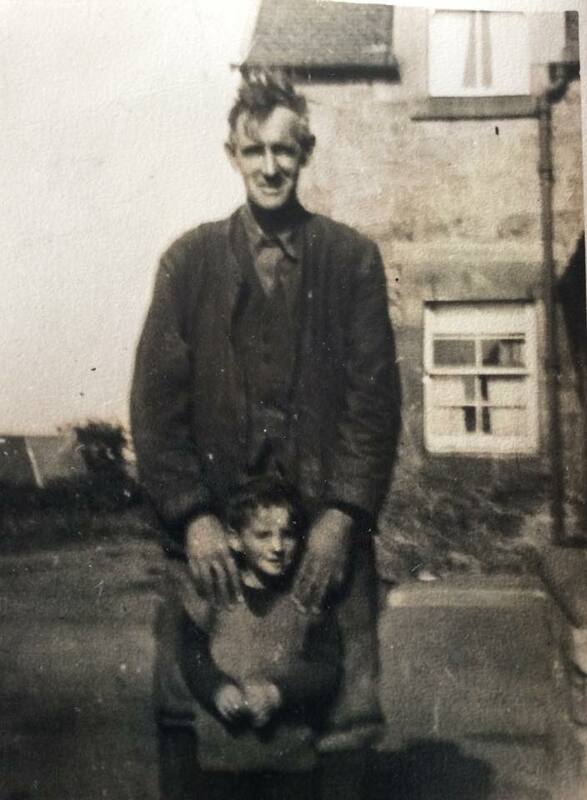 Alan Lawrie, was a hard working farmer who lived in Quarter. He grew up on his dads farm and enjoyed a happy childhood. His dads farm was called Killinhill Farm and it was one of the largest farms in the village. 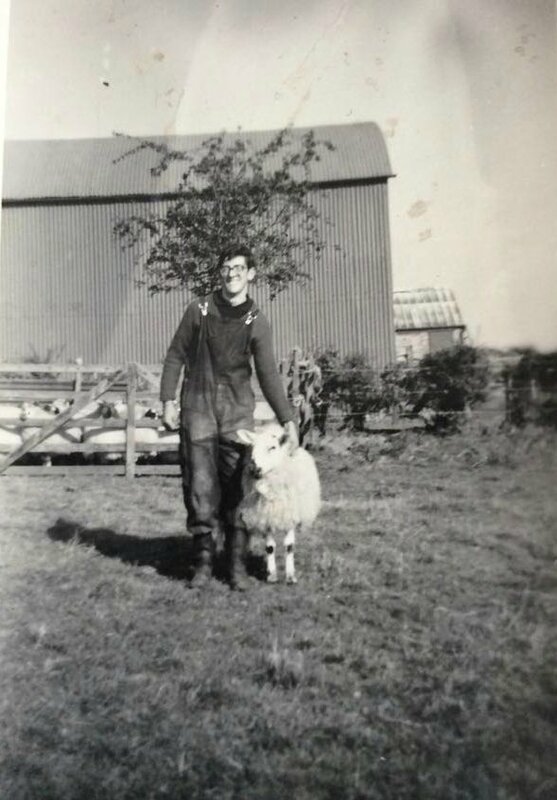 Alan as a young boy with his Dad on their farm. Alan’s story is a very sad one and was told to Historic Hamilton by a family friend who now lives in Australia. Helen Williams told us: “I don’t have all of his story but from what I know he was penniless living on the streets when my brother took him in and got him a job driving a tractor” I can only imagine that this would have gave Alan some of his pride back and hopefully a bit of happiness as he would have been once again doing something that he loved. 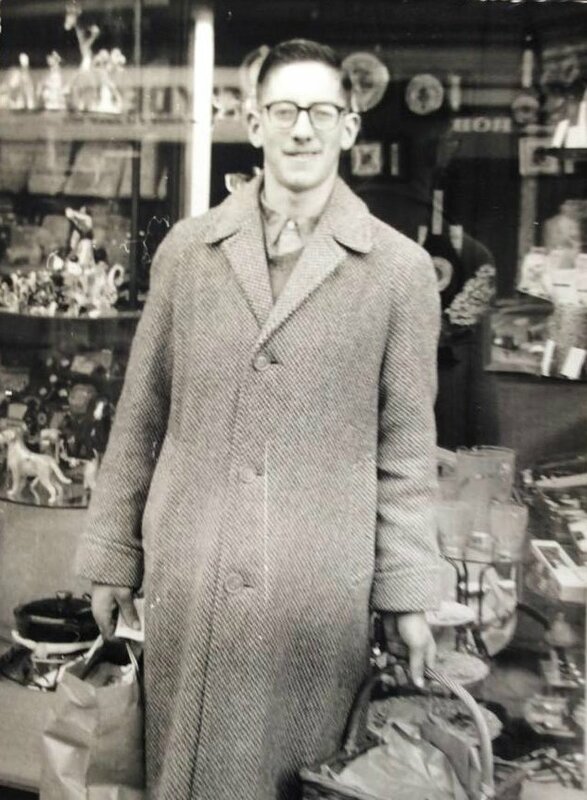 Alan out doing his shopping in Quarry Street in Hamilton c1960s. Helen continued: “Alan went from riches to rags with lawyers taking much of what he owned and then eventually other people or so-called friends taking advantage of him. He eventually lost his family farm and not only was this farm his livelihood, it was also his family home. Alan had no option but to find an alternative home and at one stage he lived in a small caravan with no heating or running water, but things got worse for poor Alan, he eventually ended up out on the street”. Alan told Helen that when he was homeless he used to have wash at Hamilton Baths! Helen went on to tell us “I had said to Alan that too many photos end up in the bin when people leave this world and I feel we should log them. We didn’t even know that Alan had the photos, he has no direct living family. I’d say they are the only things he has left of the days on his farm”. There are still kind people in this world and Historic Hamilton would like to say well done to Helen’s brother who took Alan in from the streets and gave him work and a new home. Alan still lives in Helen’s brothers house in East Kilbride and is now 71 years old. Posted on September 29, 2015 October 1, 2015 Categories UncategorizedLeave a comment on Alan Lawrie of Quarter. 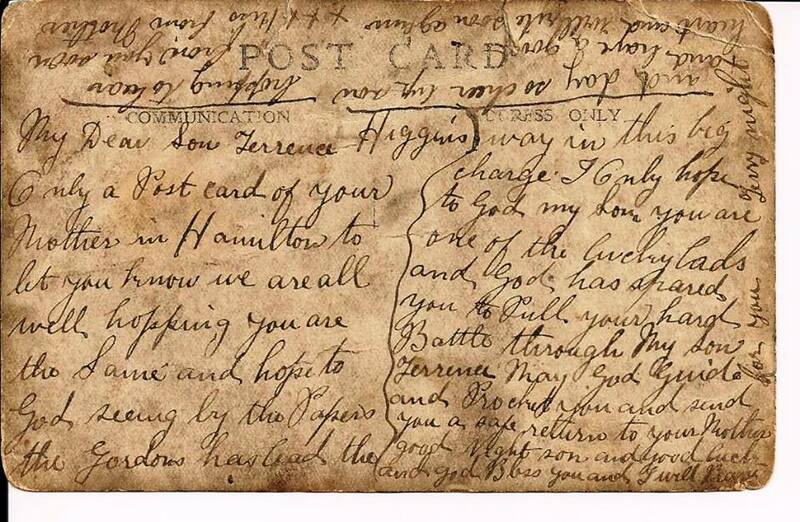 This is a heart felt postcard sent from a mother to her son during the first world war. The lady in the photo is Mary (Murphy) Higgins and this is a poignant post card to her son Terrence Higgins who was away fighting at the front line. Postcard from Mary Higgins to her son Terrence. Terrence was one of the lucky ones who did return home safe to his mother, he did however, lose an eye when on the front line. Terrence eventually did what every other man did after the war, he got on with life and went back to work down in the coal mines. Later in life, Terrence lived in Fairhill where he lived into his late eighties or early nineties. He was a great character, an old tough miner with a great spirit. 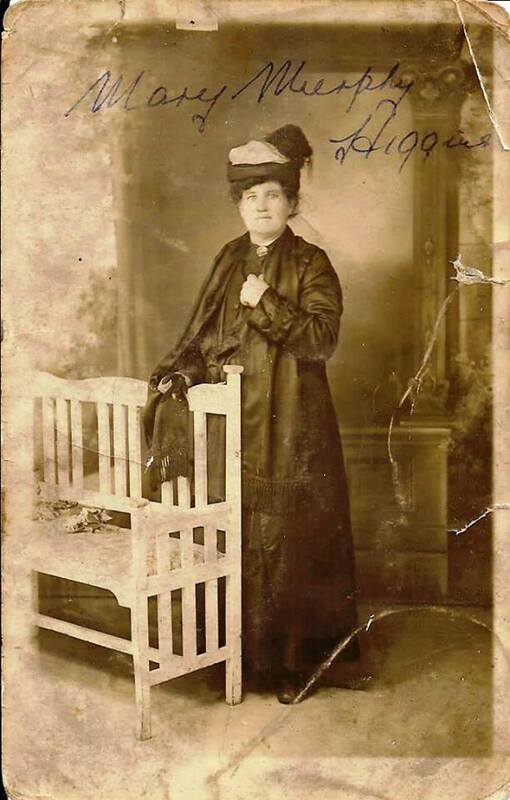 Historic Hamilton would like to thank Tom Odgen Keenan for sending us this fantastic snapshot in time of his Great Grandmother Mary Murphy Higgins. 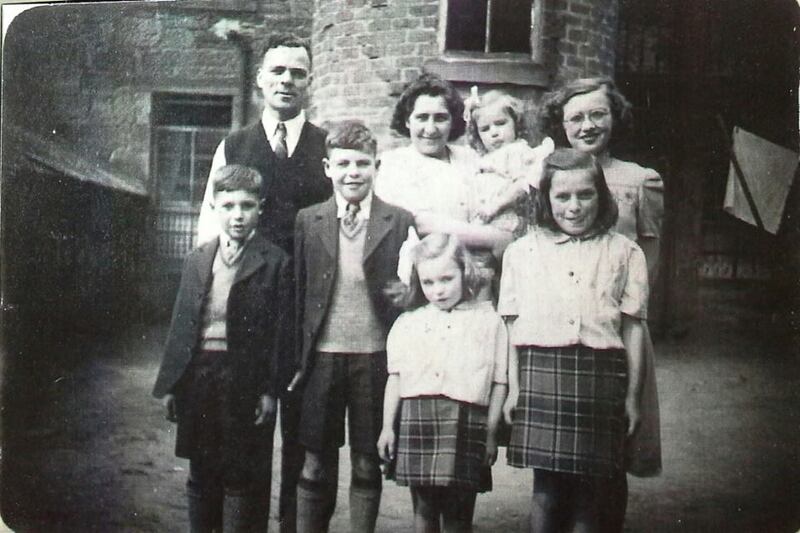 This is the Hardy family and in the photo is William & Maisie Hardy, and their 6 children left to right: Thomas, Robert, Anne, Jane, Mary (The Baby) & Betty. The picture was taken c1949 at their Tuphall Road house in Hamilton. They later moved to Westwood Crescent in 1950 and some years later moved to Burnblea Street. Maisie Hardy nee McKechnie lived in Wishaw and was educated in Wishaw Public School. She worked as a head cook in service in a castle in Ecclefecan and was reknowned in the community for her kind charitable nature and fabulous home baking and cooking. The local Drs frequently visited for home baking and tea, William originated from Blantyre and then moved to the Old Town in Hamilton and was educated at St Mary’s. He worked as a miner in Blantyre, then India Tyres in Inchinnan till his retirement. When he wasn’t working, he enjoyed tending to his garden. Historic Hamilton would like to thank the Granddaughter of William & Maisie Hardy for sending us this fantastic family picture. 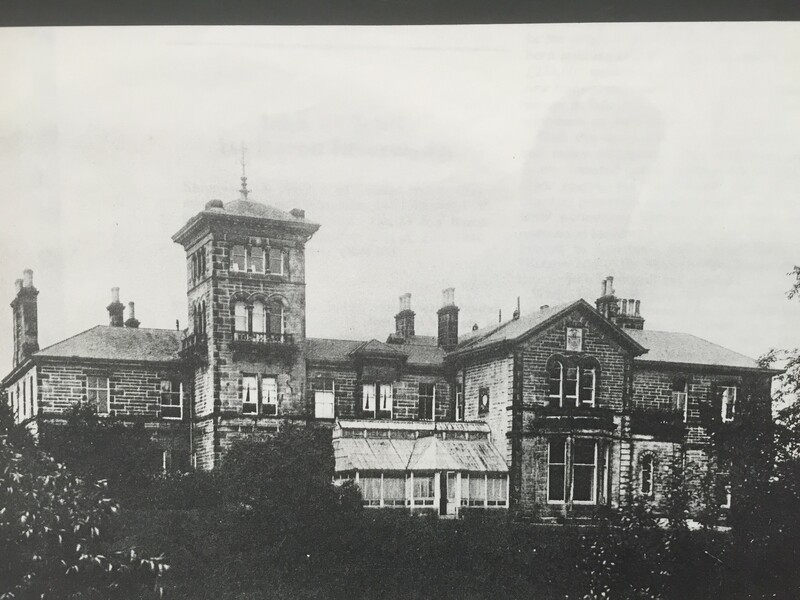 Glenlee House was a rural mansion that was situated at Udston in Burnbank. 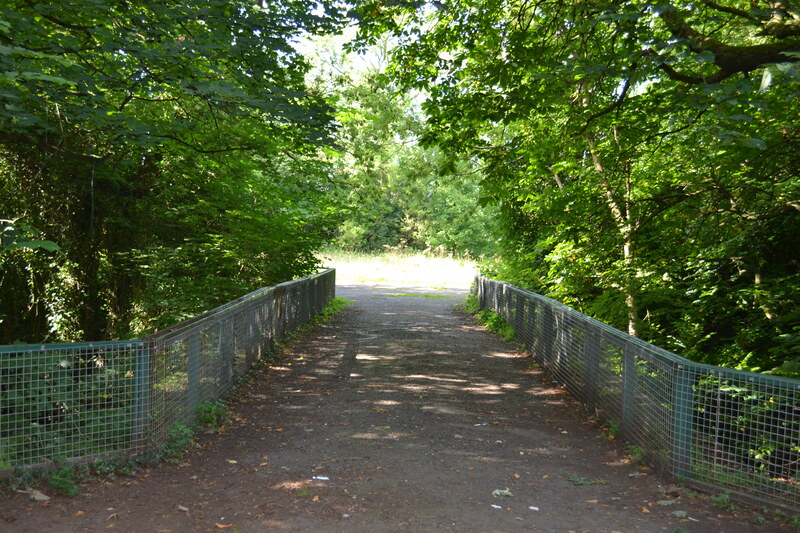 It stood between two parallel burns, one was at the border with Blantyre and the other ran through Udston. The house was a fine example of Victorian stature and was not only a large luxurious house but it also showed people how rich the owners really were. The mansion was built in the mid 1800s and was first owned by Alexander Miller. It was a 2 storey building with 30 rooms and was accessed from Thorntree Avenue, which accommodated a turning point for horse drawn carriages. 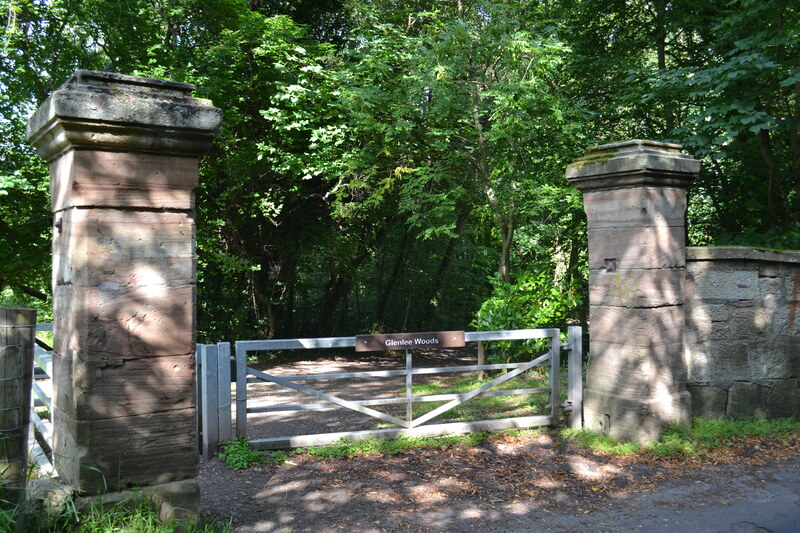 After going through Thorntree Avenue you passed through two stone pillars at Russell Street – which still stand to this day. The turning point for the horse & carriages at Thorntree Avenue. The Russell Street entrance of Glenlee House. 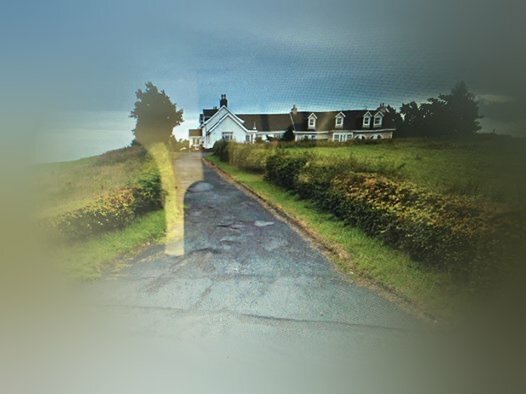 You then travelled along a curved avenue of trees and over a bridge at the burn that runs through Udston and as you came to this bridge, Glenlee House was straight ahead. The former site of Glenlee House. The imposing frontage of the 2 storey building with its further two storey glass tower, was set in the centre of an oval lawn. Ivy dressed the large bay windows, a weeping willow tree grew near the entrance door and there was further shrubs and lovely trimmed bushes that lead down the second driveway that took you to the gate keepers lodge. 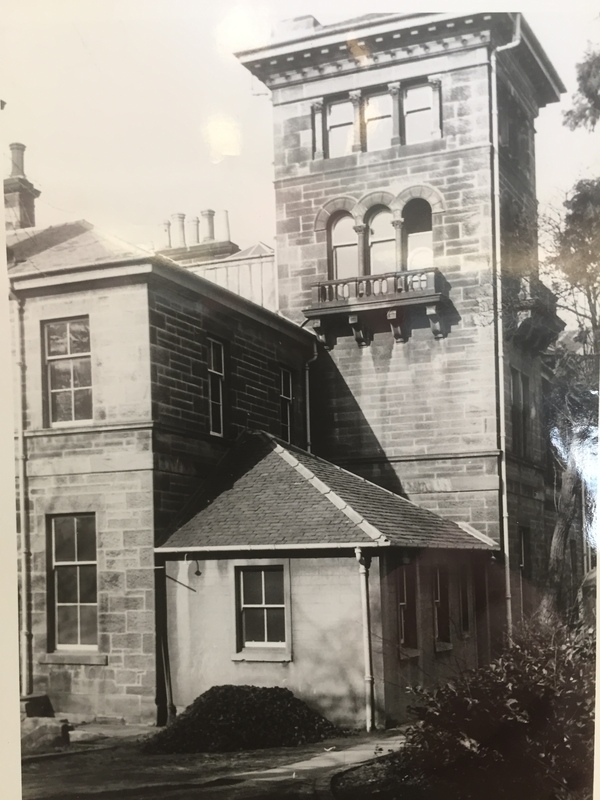 After 1861 the house was owned by Lewis Potter, an owner of a shipping company, a director of the City of Glasgow Bank and who was famous, not for his businesses, but for his imprisonment for defrauding the bank in 1879. Lewis Potter had been director at the bank since 1858, he and his colleague Robert Stronach, were both found guilty of fraud and each sentenced to 18 months imprisonment. 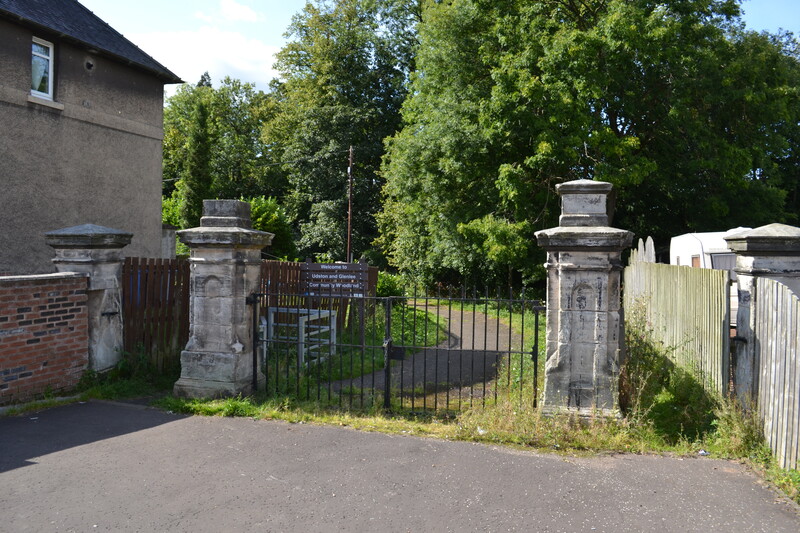 The Udston Road entrance to Glenlee House. In the year 1878 when Lewis Potter was Jailed, J Clelland, Chairman of the Cunard Steamship Company bought the mansion and owned it for over 20 years. The last recorded tenants in the house were the Burns family, who were connected with the Burns-Laird shipping line, a ships bell hung outside the house during the time that they lived here. The house was taken over in 1914 just before the first world war by Hamilton Town Council for use as a hostel for Belgian Refugees. In the 1920s Glenlee House was used as a tuberculosis hospital. 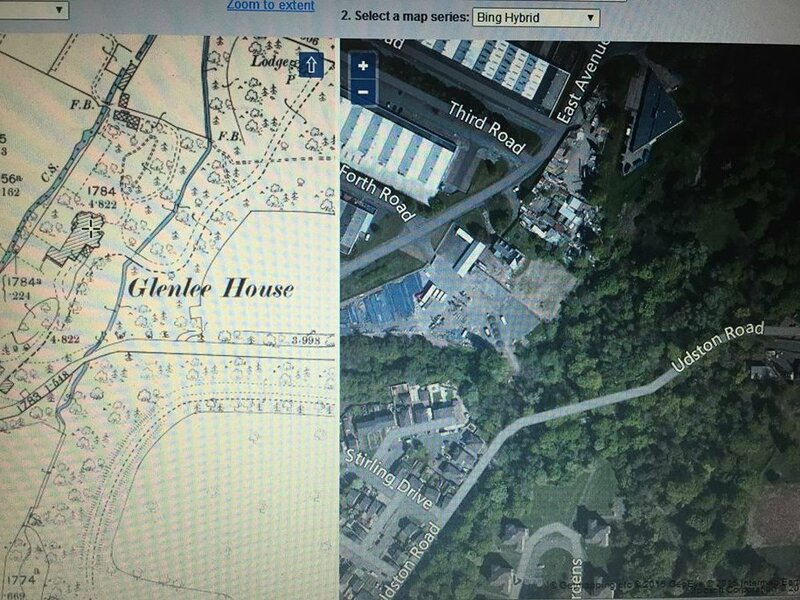 1892 Map of Glenlee House & today’s satellite image of the same area. 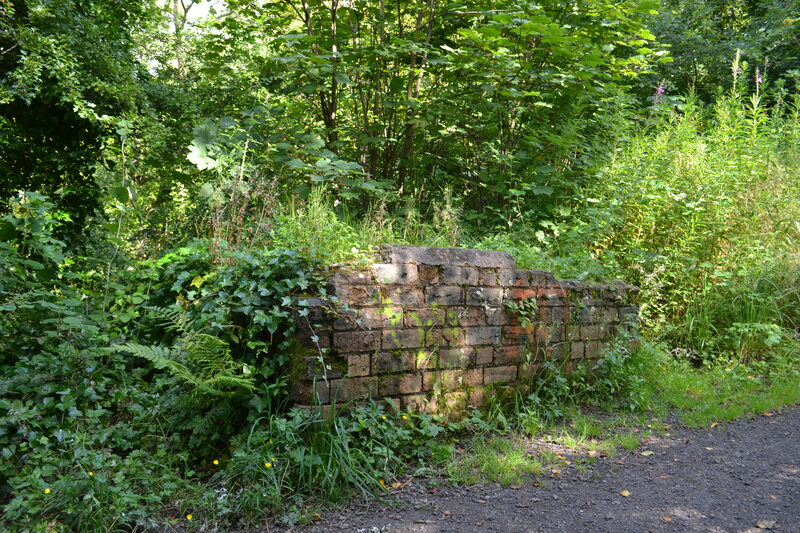 Old ruin of unknown building at Glenlee House. 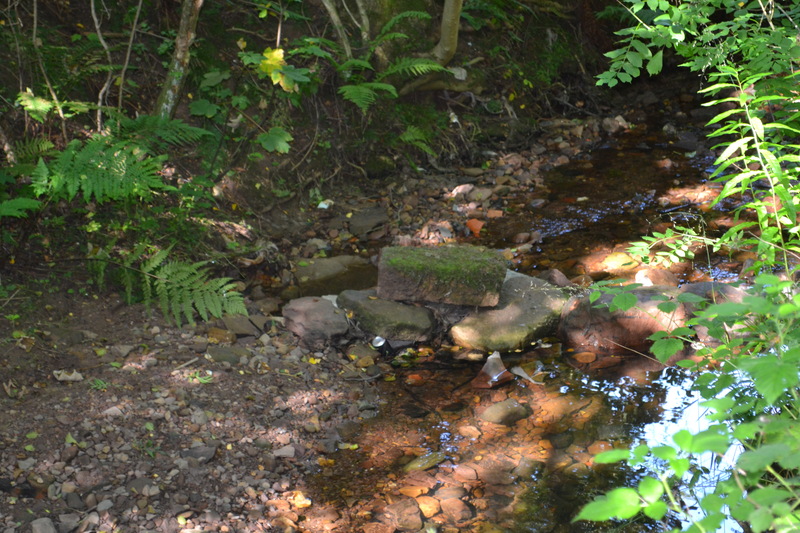 Old sandstone block left over from the demolition of Glenlee House, The block lying in the boundary burn between Blantyre & Burnbank. By the mid 1960s the house fell in to decline and was unfit for purpose, so it was taken into private ownership, by Joe Gans, father of Walter McGowan (World Flyweight and British Bantamweight Champion) and was used as a gymnasium where Walter trained for his fights. In 1971 the last known owner was Jan Stepek who was also the owner of the legendary TV rental shops, he only used the house for storage. Glenlee House (South Front) 1965. 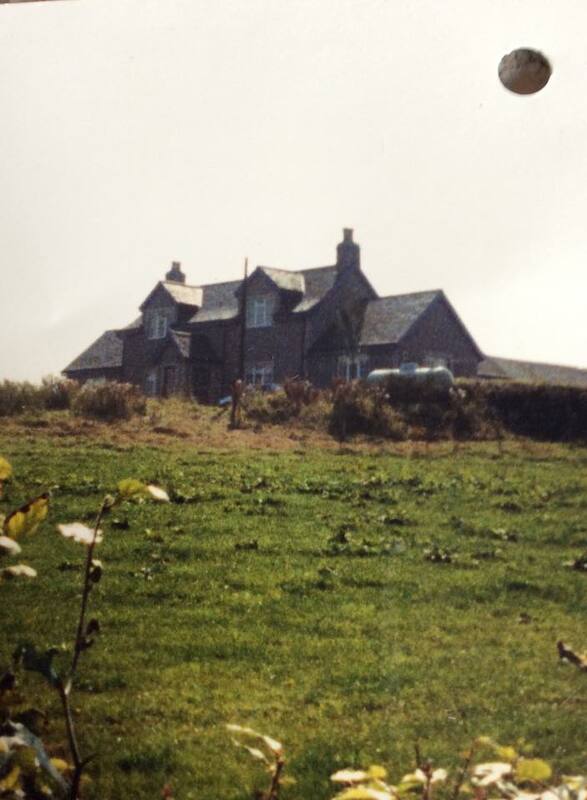 Sadly Glenlee House was demolished in the mid 1970s, partly due to subsidence from the underground coal mines but also because it was run down so badly. 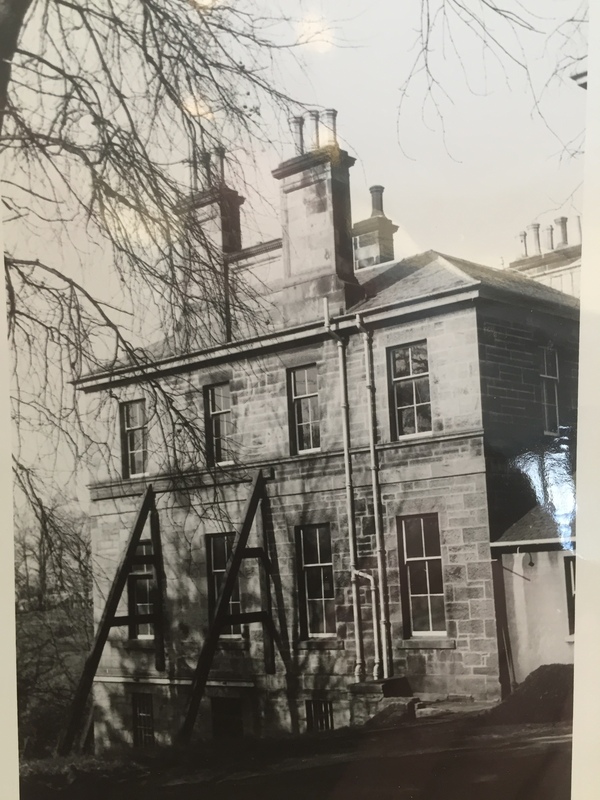 Glenlee House was another one of Hamiltons country mansions that had been lost as a result of the underground workings, and today, if it was still standing it would be a credit to Burnbank. Glenlee House (South Front) Beams holding up the south front wall due to Subsidence from the underground coal mines. 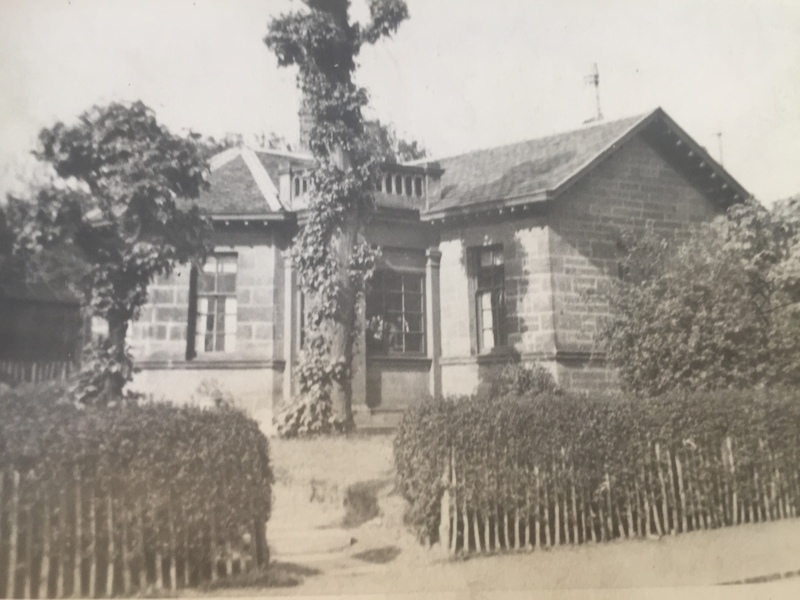 The Gatekeepers Lodge that was situated at the corner between Russell Street & Burnbank Road. How many times have you driven down Muir Street and looked over to the back of the Hamilton town house and noticed the large car park. Perhaps you work at the library and park at the staff car park behind the building or do you even live at Back Row? The Hamilton town house car park looks spacious and has a rectangle shape to it, however this area wasn’t built or designed this way to make space for cars. 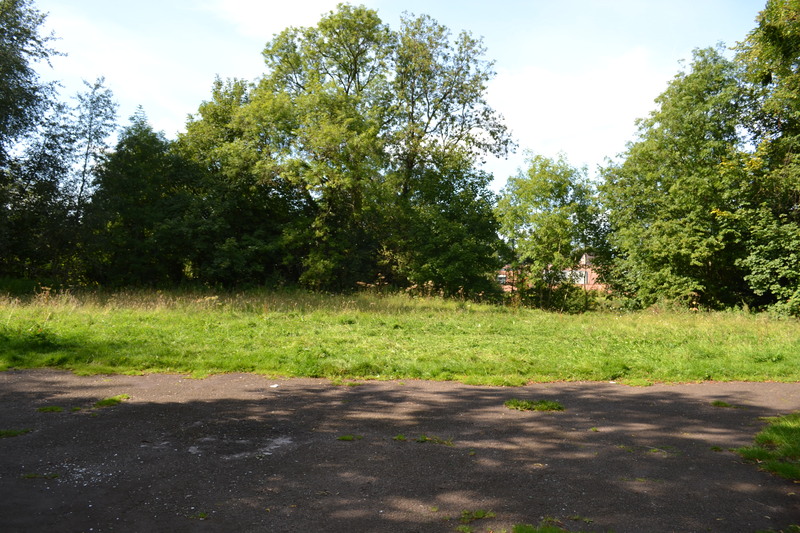 The land beneath the car park is actually an old graveyard. The tarmac was laid over the graves as the last coffin was laid over 100 years ago. Before Smellie’s Auction House was built there was a United Presbyterian Church of Scotland that was large enough to hold 1050 seats. 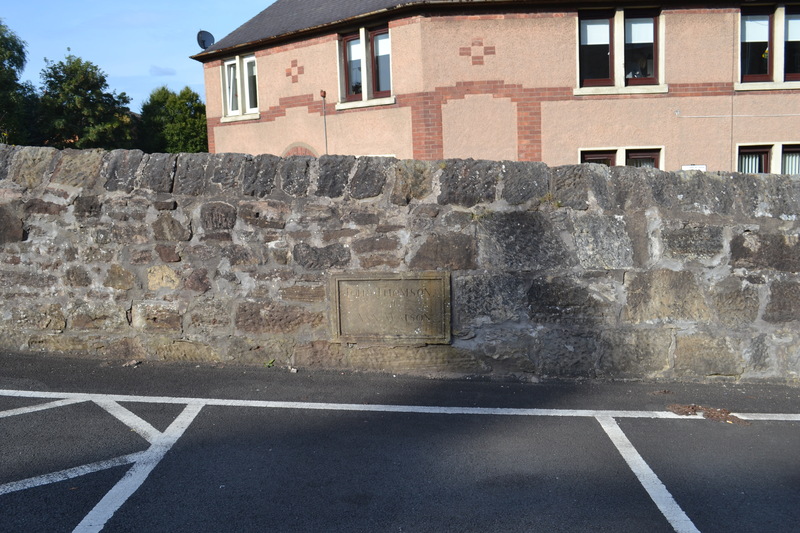 The church occupied the same area of land as Smellie’s at the corner between Muir Street & Lower Auchingramont Road and the graveyard was situated directly across the road from the church. 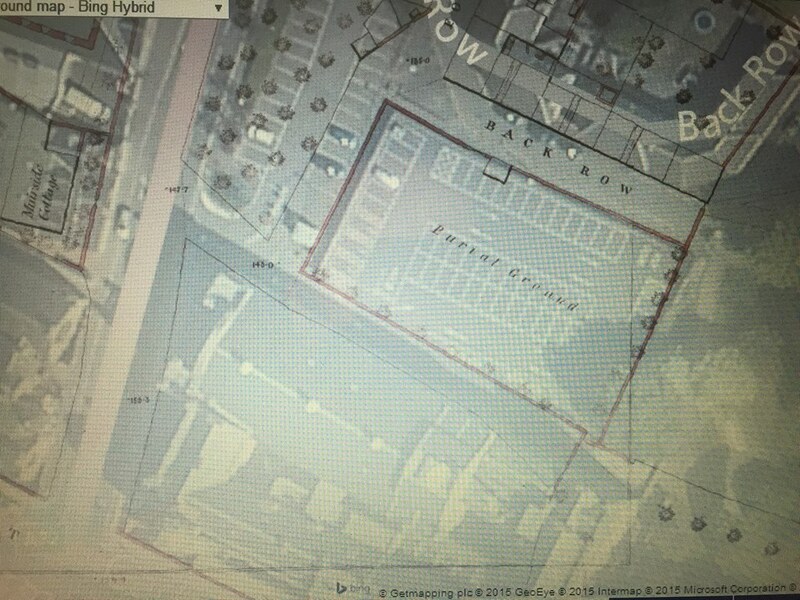 It was rumoured that the graves were all moved to the Bent cemetery after they removed the headstones from the graveyard, however there was over 300 graves at the car park and at the Bent there is only one marker stone that could possibly only hold four graves at a maximum. 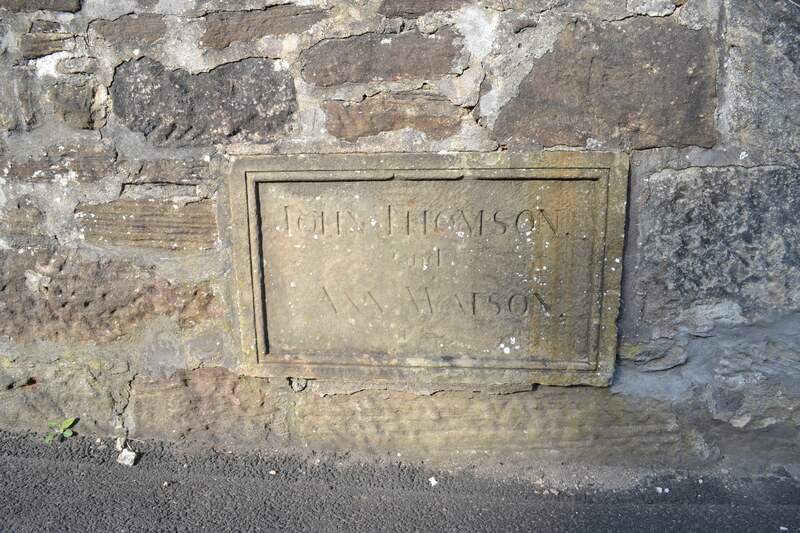 The only evidence to this day that the graveyard even existed is a marker stone that shows where the burial place is of John J Thomson & Ann Watson who could have possibly been Husband & Wife. Today I paid my respects to all the people of Hamilton who are currently buried at the old Hamilton graveyard under the car park of the Hamilton Library! The next time you drive past take a minute and spare a thought because this could be your ancestors that are laid to rest here.